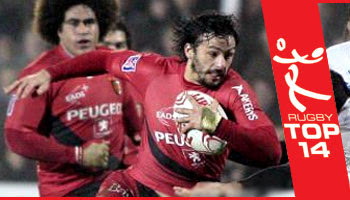 French running rugby at it's best is unlike anything else you'll see on the rugby field. Sublime, mesmerising, and unpredictable, when the French teams decide to run with the ball you'd better watch out, because anything can happen. The French Top 14 league is the premier rugby competition in France, and features the top 14 professional rugby clubs from around the country. These days, the league is attracting a lot of overseas players. This has created a lot of interest and focus on French rugby, particularly this season, with the standards of play being right up there with the best. This year we've seen some great tries so far, and with that, we've brought you this great clip of the best tries from the current 2008 season. Try in 5th was the best for me. ah why doesn't Setanta show top 14 anymore ? Great vid ! Too many flukey chip-and-chase or guys busting through weak tackles. That's not what French rugby is about. The free-flowing, counter-attacking, back and forwards inter-linking, multitude of passes that you come to expect of the French. For my mind, Clement Poitrenaud and Joe Tekori's tries are the best of the lot. I love the Number 17 in the last try who is so focussed on following up with Heymans that he runs into the post! He he! Great tries. Loving the European rugby this year! I agree, I don't usually read comments but was going to post on this one that there are too many poor tackles. I dont understand the comments. great tries are very often scored because of some poor tackles, but this doesn't make them ugly! the art of provoking the defense in order to make the most of every single mistake is enjoyable too. plus, poitrenault's is really a pure beauty. and if you watch heymans', you don't see alot of missed tackes, just the first one. after that it's just some great speed and lines! It's funny how some people are so negative about "poor tackles". Look at the half assed tackles made during some of Jonahs finest tries and even "that try" from the Barbarians against NZ. It's sometimes the effort made by the attacking player that causes the weak tackle, if this wasn't the case nobody would ever score. Keyboard warriors are go!! Let's just be negative and moan about everything. Wow, some great tries but what really struck me was just how hideous team jerseys in the French league are!! I'm sure that fly half weighs less than Phil Bennett. How can you not have the prop try set up by Brock James against Castres in this list! It is one of the best tries I have seen this year let alone the Top 14! 10 by farid sid was the best. boff!